The goal of Woodleaf Farm's soil management system is to build soil organic matter and balance soil nutrients in order to produce healthy trees, optimal annual growth, and high-quality, flavorful fruit. Woodleaf supplements soil nutrients with soil- and foliar-applied materials, based on soil test results. In the 1980s and 1990s, soil organic matter (SOM) ranged from 2 to 3%. From 2000 through 2014, it was 4 to 6% (Fig. 1). In the 1980s, average SOM was 2.2%. By 2014, it had climbed to 5.1%. Over the same period, average cation exchange capacity (CEC) increased from 9.5 to 11.7 meq/100g (Fig. 2). Soil nitrate-nitrogen (N) levels have generally decreased, from an average of 23 ppm in the early 1980s to an average of 9 ppm in 2014 (Fig. 3). Levels of total N (organic plus nitrate ammonium N) are relatively high, ranging from 4,054 ppm in the oldest field to 2,564 ppm in the youngest field (Fig. 4). Soil samples taken since 1982 indicate that all soil macronutrients—potassium (K), phosphorus (P), calcium (Ca), and magnesium (Mg)—have increased and are generally within Woodleaf's target ranges (Table 2). Soil levels of micronutrients have generally decreased or remained stable over the past 10 years, except for zinc (Zn), which increased from an average of 5.8 ppm in the 1980s and early 1990s to an average of 7.9 ppm in 2014 (Fig. 5) and copper (Cu), which increased rapidly to excessive levels in the late 1990s and early 2000s (17.4 – 26.1 ppm) during/after the time Cu was sprayed for peach leaf curl disease (until the early 1990s). Cu levels stabilized after spraying stooped and in 2014 averaged 5.2 ppm (Fig. 6). Annual tree growth ranges from 10 to 20 inches. Leaf tissue N is in the adequate average range for peach trees (Fig. 10). Records from O'Henry peaches growing in the same field in 1994 and 2014 indicate a slight increase, from 2.4 to 2.74%. Leaf tissue P, K, Mg, and Ca is within or above the adequate range (Fig. 10). Only leaf tissue S is below the adequate range. Levels of these nutrients in Woodleaf fruit were similar to those from two other regional organic peach farms, but all were below USDA averages. Fruit N is at least as high as that in samples from two other organic farms in the region (Fig. 11). Fruit levels of sodium (Na), iron (Fe), Mn, B, Cu, and Zn in Woodleaf peaches vary in comparison to those from two other organic peach farms and to USDA averages (Fig. 12). Disease and insect damage to fruit is low. Woodleaf surface-applies several kinds of plant residues throughout the year. The goal is to link N mineralization to SOM decomposition, thus avoiding nutrient loss to leaching, and to build soil C.
Through 1991, off-farm composted cow manure with straw bedding was applied to Woodleaf's oldest fields (1, 2, and 3), at approximately 10 tons/A. In 1992, Woodleaf stopped using manure and began to bring in municipal yard waste compost. When orchards are planted or renovated, a perennial grass/clover living mulch is seeded between and beneath crop rows immediately after tillage. Seed is planted in the fall, by October 15, with a cyclone seeder. The seed mix includes low-growing, shade- and drought-tolerant grasses, and 5% New Zealand white clover (Trifolium repens). Over time, the groundcover becomes a mix of grasses, clover, and weeds. Above-ground biomass is currently made up of approximately 70% grass species and 30% broadleaf weeds and clover. Dominant grass species include orchardgrass (Dactylis glomerata), California brome (Bromus carinatus), Blando brome (B. mollis), and tall fescue (Festuca arundinacea). The living mulch is mowed two to four times annually. The height of the living mulch before each mowing ranges from 1 to 3 feet. On average, approximately 2-4 tons/A of hay mulch (dry weight) are added to the soil surface each year. The living mulch residue has not been analyzed for nutrient content, and seasonal/annual variation is likely. However, an approximate nutrient contribution can be estimated, based on published averages for mixed grass hay (Parnes, 1990). Table 3 shows the approximate nutrient contribution from 2 tons/A of mowed living mulch (dry weight). Clover in the living mulch adds some N through N-fixation. The other nutrients are taken up from and returned to the soil. Regular mowing allows these nutrients to be continually recycled. The year-round growing roots of the living mulch also reduces N-leaching by the winter rains common in northern California and may help to retain other nutrients prone to leaching, such as S, Ca, Mn, and B. Green leaves and young branches are applied to the soil after pruning in late summer/fall and spring. Branches are from 0.5 to 1.25 inches in diameter. These materials have a higher carbon to nitrogen ratio (C:N) and degrade more slowly than the living mulch. Pruned branches are placed in row middles over the living mulch. They are broken up first with a rotary tractor-mounted mower and then mowed again with a small riding mower and blown beneath trees (see soil/insect management video). Carl purchases yard waste compost from a municipal composting facility 20 miles from the farm. Compost consists of grass clippings and branch/leaf prunings that have been aerobically composted with a bed turner. Compost is applied two to four times per year, usually in spring and fall. The current rate is 2 tons/A (dry weight) per application. In the past, 4-6 tons/A were applied annually. As soil fertility increases, Woodleaf is experimenting with reduced rates. Compost is applied primarily to row middles with a compost spreader. Some is blown under trees. Compost is irrigated into the living mulch immediately following application. Nutrient analysis of off-farm yard waste compost is shown in Table 4. Tillage is an important part of many organic farming systems that utilize plant residues for soil fertility management, particularly annual horticultural systems. However, tillage is used very little at Woodleaf. Tillage occurs only when fields are brought into cultivation or during renovation and replanting (every 20 or 21 years). At all other times, organic residues and fertilizers are surface-applied and usually not incorporated. Some fields have not been tilled for 21 years. During field renovation, a front end loader is used to pry out tree stumps and remove them from the orchard. To break up the understory sod, three passes are then made using a box scraper with five rippers lowered to 8 inches. Soil mineral (nutrient) balancing is a foundation of Woodleaf's soil management system (Table 1). Carl's system is based on years of farming experience and on research and recommendations by Neal Kinsey. Soil nutrients are supplied primarily through application of organic materials and supplemented with off-farm, purchased minerals when soil tests indicate they are needed. The need for mineral amendments is indicated when soil analysis shows levels of nutrients below targets (Table 2). Minerals are surface applied or incorporated at planting or during field renovation. Boron: Despite annual B applications of 10 lb/A for more than 15 years, soil B remains below Carl's target of 0.8 ppm (Fig. 7). Carl has limited annual B rates to a maximum of 10 lb/A. However, he is considering raising this ceiling. Sulfur: Gypsum is applied each spring at 250 lb/A. Nonetheless, soil S is still below Carl's target of 20 ppm (Fig. 8). Calcium: In the past, Ca was added as limestone. Currently, annual gypsum application at 250 lb/A helps increase the Ca portion of cation balance, while reducing the Mg portion, currently 18% (Fig. 13, Fig. 14, and Fig. 15). For information on how Carl calculates Ca and Mg rates, see Calcium and Magnesium Amendment Calculation below. Manganese: Despite regular Mn applications, soil Mn remains below Carl's target of 15 ppm (Fig. 9). Minerals are also applied annually as a foliar mineral mix. Carl's soil test results, mineral balancing targets, and inputs are presented in Table 2. Convert from ppm (as reported on soil tests) to lb/A. Multiply ppm by two: 1,060 x 2 = 2,120 lb Ca. Insert the formula: 10 x 0.68 x 400 = 2,720 lb Ca needed to reach the target. Current soil Ca is 2,120 lb/A, so 600 lb/A Ca needs to be applied (2,720 – 2,120 = 600 lb). A ton of limestone generally contains 600 lb Ca (depending on source), so 1 ton/A lime is needed to raise soil Ca to 68%. The goal of an organic soil management system is to build SOM and enhance soil microbial activity, rather than relying on quick-release fertilizers to directly feed crops. Decomposition, mineralization of plant-available nutrients, and nutrient retention are the foundations of soil ecosystem functions on organic farms. As organic matter decomposes, nutrients such as N, P, and K are mineralized and made available to plants. Soil microbes play a role in all of these processes (Kramer, 2006). In turn, soil microbial biomass and activity are regulated by the quantity and quality of SOM, C, and N inputs (Fierer, 2009; Kallenbach, 2011). Research has shown that total C content (Drinkwater, 1998; Kong, 2005) and/or lability (ease of decomposition) of organic matter (Marriott, 2006; Smukler, 2008; Kallenbach, 2011) determine how organic amendments will affect microbial biomass by affecting the rate of decomposition and N mineralization. Materials with higher C content tend to decompose more slowly, thus releasing N slowly over the season. Organic amendments such as manure, grass and/or legume cover crops, mulches, and compost vary in C content and C:N ratio. Therefore, they vary in their rate of decomposition and in how they stimulate microbial biomass. N and other nutrients are supplied gradually from the reservoir of SOM as crops need them. Leaching losses are minimized due to gradual N mineralization. The microbial community is dominated by fungi, which flourish during early stages of residue breakdown. Carl balances the high-C organic materials with green organic matter by regularly mowing the living mulch. This prevents N immobilization, which could be a problem if too much C were applied. Woodleaf's N and C cycling system works in a synergistic manner with its biological insect pest management system. In 2014, Woodleaf evaluated its apparently successful N-cycling system by looking at fruit quality, leaf tissue nutrient concentrations, soil organic N, and other soil nutrient levels. Small sample sizes were used in this evaluation; funding for a more complete evaluation with larger sample sizes would be preferable. 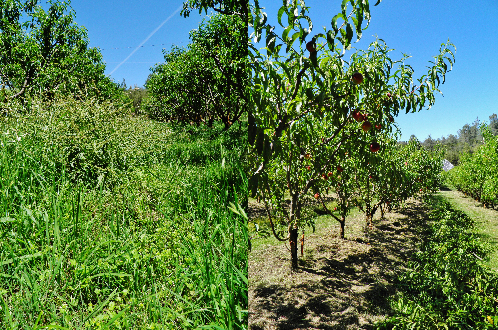 Woodleaf performed fruit tissue analysis on three random samples (two fruits per sample) of O'Henry peaches from field 2 (in a location where the same variety had been replanted and grown since 1985). Results were compared to three random samples (six fruits) of O'Henry peaches from two other successful long-term organic farms in northern California. Results were also compared to the USDA average nutritional content for peaches. Leaf tissue samples were taken from the same rows as the fruit samples. Carl compared results to tissue nutrient concentrations in O'Henry peach trees from the same field in 1994 and to normal average ranges reported by A&L Western Laboratories, Modesto, California. Soil samples were taken from the same rows (0- to 12-inch depth). Soil was also sampled in four other fields. Soil was analyzed for organic N (total Kjeldahl N – ammoniacal N) and nitrate-N. Trends were plotted for the period 1982–2014. In 2014, Woodleaf recorded a very good yield and the most economically successful year in its 34-year history. No insecticides were applied to peaches, pears, or apples, yet insect and disease damage was less than 10%. Fruit tissue N: Fruit tissue N (mg/100g) was at least as high as that of fruit samples from the other two farms (Fig. 11). Leaf tissue N: Leaf tissue N was in the adequate range and appears to have increased slightly since 1994 (Fig. 10). Soil N: SOM has increased, while soil nitrate-N has decreased (especially in field 1, where manures and fish meal were applied until 1992) (Fig. 1 and Fig. 3). In recent years, nitrate-N has been relatively low (averaging 9 ppm in 2014). But, organic N is now relatively high (Fig. 4). Based on long-term soil test data (1982-2014), fruit, leaf tissue, and soil data (2014); low insect and disease damage (2013–2014); and financial success (2013–2015), it seems that Woodleaf's long-term use of high-C/low-N soil amendments and reduced tillage is maintaining soil health, yield, and fruit quality. More research is needed on working farms to test the relationships among organic soil management practices, soil health, yield, and crop quality. Nevertheless, there is some scientific support for Woodleaf's success with high-C/low-N amendments. One study conducted not far from Woodleaf (in central California) compared 13 tomato fields on 13 organic farms. Each farm used different soil amendments with different N-cycling scenarios. Some used mostly manure (higher N), while others used mainly composted yard waste (higher C). Yields were similar on all 13 farms. However, manure application was associated with increased Olsen P, increased gram-positive and gram-negative bacteria, and decreased fungal and mesofaunal markers (Bowles, 2014). Other studies report that higher P may negatively affect soil fungi abundance and activity (Fierer, 2009; de Vries, 2012). Soil management practices that support healthy soil fungal communities have been suggested as a way to increase N retention and other soil ecosystem functions (de Vries, 2012; Jackson, 2012). It is likely that other parts of Woodleaf's soil system are just as important, especially reduced tillage and possibly mineral balancing. Several researchers have shown that tillage decreases soil microorganisms, specifically soil fungi (Calderón, 2000; Minoshima, 2007; Young-Mathews, 2010). Parnes, R. 1990. Fertile soil: A grower's guide to organic and inorganic fertilizers. agAccess, Davis, CA.